Fred Carson is given amazing strength by a magic ring given to him by Tibetan mystics, and keeps a day job as a "timid radio engineer and inventor". Those elements all sound closer to Captain Marvel's details-to-be, but we'll concede that 1) "Wonder Man" isn't a far cry from "Superman", 2) one plays at being timid and the other at being "mild-mannered", and 3) they have the same powers. 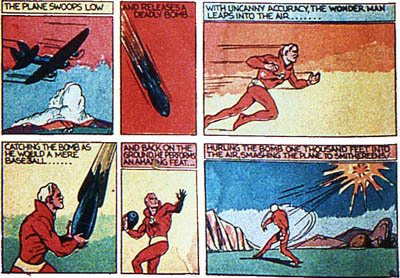 Just look at how Eisner draws Wonder Man running at locomotive speeds, looks awfully familiar. Obviously, there's also a girl around the office, the boss' daughter Brenda/Nora (this is an obvious rush job, with character names changing between panels and Wonder Man inconsistently wearing hia mask), acting as a Lois Lane stand-in. 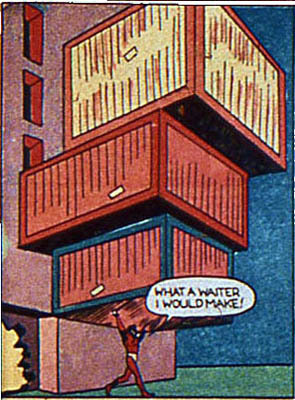 So whatever happened to Wonder Man when he was denied a second issue? No one knows. At least he had skills he could fall back on in the job market. 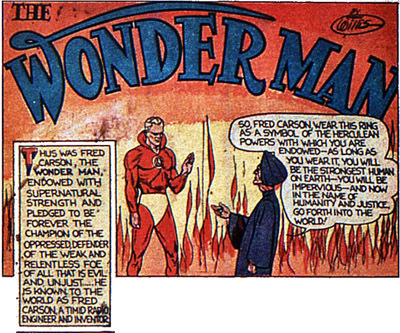 Wonder Comics would go on, and Wonder Man's loss would be The Flame's gain. 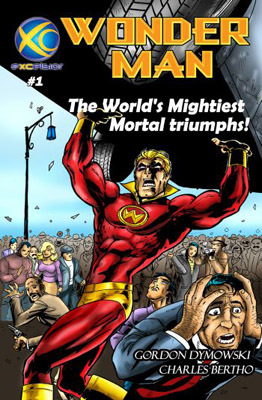 But now that nobody cares and he's fallen into public domain, Wonder Man has made a comeback through the magic of web comics! You can follow his adventures at http://wondermanexcelsior.blogspot.com ! No lawsuit problem this time. 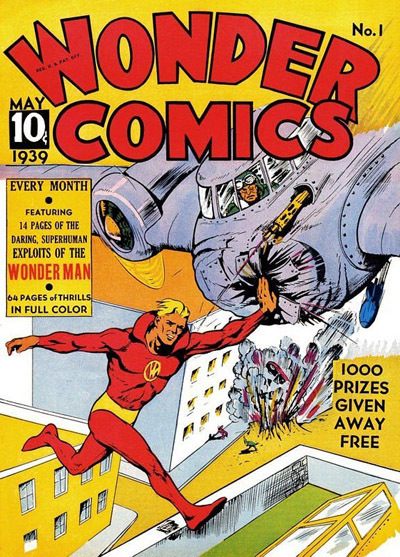 Wonderman wears tights, while Superman never...has? As the writer of the webcomic WONDERMAN, I thank you, sir! Hey, what are blog-pals for? Hey, and a bonus Action Comics #1 homage at the end! Get Out of the Beast's Face! Who's the Golden Age Firebrand? What Have I Got Myself Into This Time?